JOHANNESBURG (AP) — The Chiefs and Stormers continued their winning starts to Super Rugby on Saturday, and the Lions suggested their run to last season's final may not have been a one-off with a pulsating, never-say-die victory over the Sharks. The Chiefs lead the overall standings after rousing themselves from a slow start for a 28-12 bonus-point win over the Bulls, extending their record to 5-0. The Stormers were never in danger against the Cheetahs, scoring eight tries in a 53-10 rampage to match the Chiefs' five wins from five. But it was the Lions who moved up to second ahead of the Stormers having played one game more. The rise was made possible when a late try by Lions flanker Jaco Kriel settled a titanic South African derby against the Sharks in Johannesburg. The Lions won 34-29 in a game that swung back and forth before replacement Kwagga Smith burst away and put fellow loose forward Kriel clear down the right wing in the 76th minute for the final, decisive score. In other round six action, defending champions the Hurricanes were too slick for the Queensland Reds, winning 34-15 with tries from both the Barrett brothers. The Blues struggled before finally subduing the Western Force 24-15. 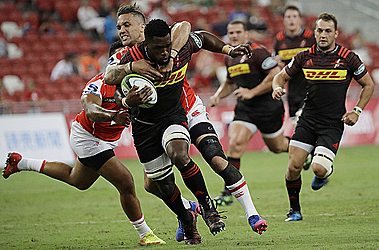 Two points separate the Hamilton-based Chiefs of New Zealand and their chasers from South Africa, the Johannesburg-based Lions and Cape Town-based Stormers. New Zealand's Crusaders can go to 6-0 and retake the overall lead from the Chiefs if they beat Australia's New South Wales on Sunday in the last game of the round. The Chiefs trailed 9-3 after a scrappy first half at home against the Bulls but took the lead for the first time with wing Shaun Stevenson's try in the 48th minute, and clinched a bonus point with tries in the last 10 minutes from Damian McKenzie and Atu Moli. "We asked the boys for a bit of a mental shift at halftime and they obviously responded," Chiefs captain Aaron Cruden said. No. 8 Sikhumbuzo Notshe scored a hat trick and wing Dillyn Leyds had two tries to lead the Stormers to their convincing win over the Cheetahs. In Johannesburg, the Sharks led the Lions 13-3 with an early try from prop Coenie Oosthuizen, who thundered down the middle of the field after supporting a break from wing Kobus van Wyk. A yellow card for lock Etienne Oosthuizen let the Lions back in the game, with the home team scoring 14 points while the Sharks were down to 14 men. The Lions then went out to a 23-16 lead. The momentum changed again and Sharks flyhalf Curwin Bosch kicked a huge penalty from well inside his own half to edge the Durban-based team ahead near the end. Opposite number Elton Jantjies levelled at 29-29 before the try from Kriel extended the Lions' winning run at home at Ellis Park to nine games in Super Rugby. "That was fantastic, thoroughly enjoyable," Lions captain Warren Whiteley said. "We play rugby for games like these. We probably had it a bit easy in our previous games. This was really a fight." The Auckland-based Blues scored two second-half tries to beat the Force 24-15 and New Zealand teams made it three wins from three when the Wellington-based Hurricanes swept aside Australia's Queensland Reds in Brisbane. The seven-time champion Crusaders can make it four from four for New Zealand against the Waratahs on Sunday. For the Hurricanes, Jordie Barrett scored 14 points and brother Beauden, the All Blacks flyhalf, rounded off the win over a game Reds team by going over in the last minute. The champions have lost only once this season and remain in touch, just four points behind the Chiefs.